This is an ideal game for a close circle of friends who know both groom and bride-to-be very well. Other guests can play it with just wild guesses. This is a fun filled and suitable game specially for co-ed showers. How to Play: Before the bridal shower, ask both bride and groom ceveral things. Like who is their favorite band or what kind of food they like etc. then write things told by bride and groom on this game card using some image editor. If you need some paid help you can contact me to personalize this game for you. After that take print outs and distribute it among your guests along with a pen. Guests will have to guess whether bride said it or the groom and they have to tick moustache if groom made that statement and lips if that thing was said by the bride. The person with most correct answers will be the winner. 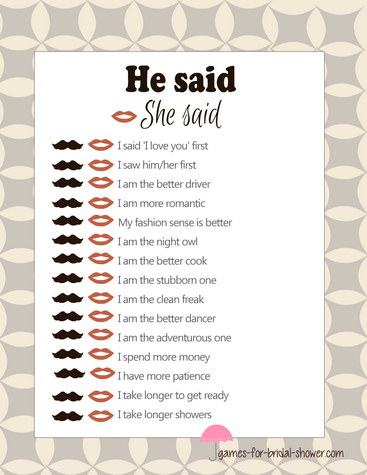 This is a free printable template of He Said, She Said game in elegant off-white color. Just click on the image shared above and save the bigger version that you can print using your home printer. This is the template for this game in pink color. You can print this if it matches your bridal shower theme more. 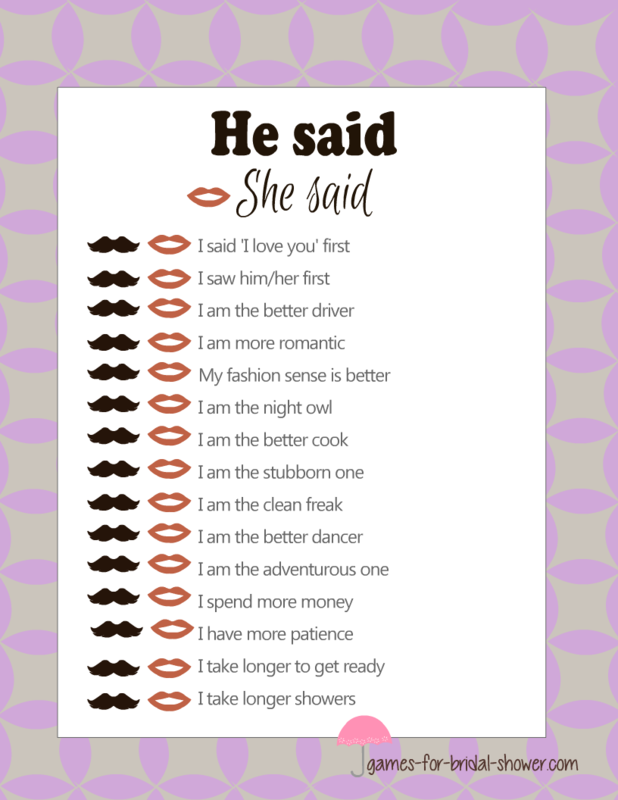 This is free printable he said, she said game in purple color. Click on this game and right click and save the bigger printable version.